Home » RainyDayKitchen » First Grill. First Furmint. First Vermont. First Emptied. 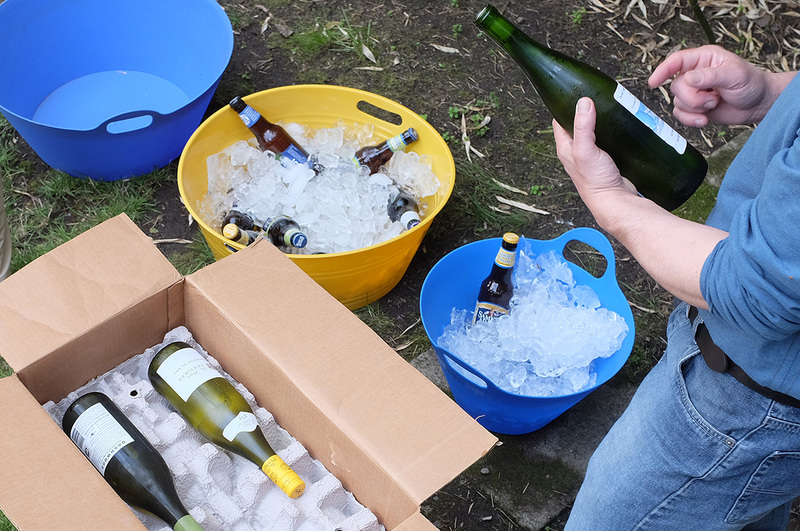 The editors at Rainy Day Magazine had extended an invitation to FirstGrill before and I’m happy to write that this year schedules aligned and we added an allocation of vino to the annual Summer kick-off bash. We put together an eclectic little collection of specialties to taste, as did the FirstGrill kitchen. 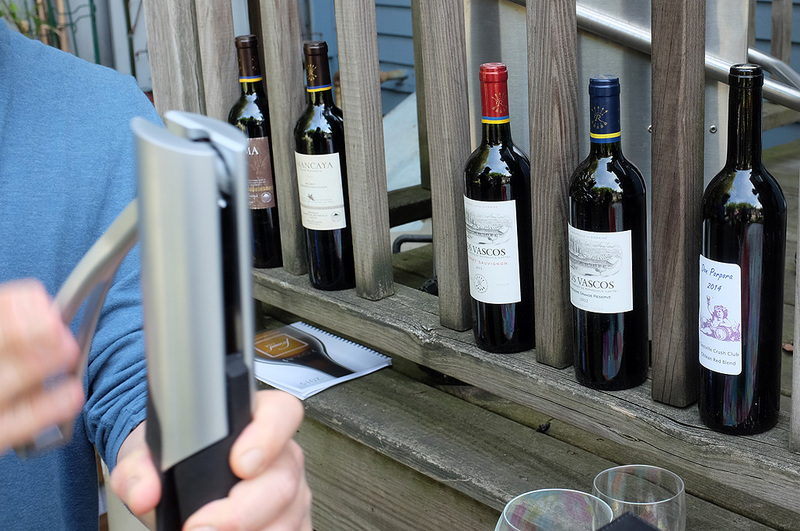 Our Vermont Wine Media (VTWM) pals at Pasternak Wine Imports recently announced a campaign to promote summer grilling partners, which we thought was a perfect match for FirstGrill. Pasternak offered up signature reds from Chile and Argentina, and a pair of Sauvignon Blancs, one each from France and New Zealand. Still wearing our VTWM wide-brim summer hats, we brought a sample of Hungarian wines from the folks who represent FurmintUSA, which is working to help raise awareness here in the States about the fine wines made from the ancient Furmint grape. 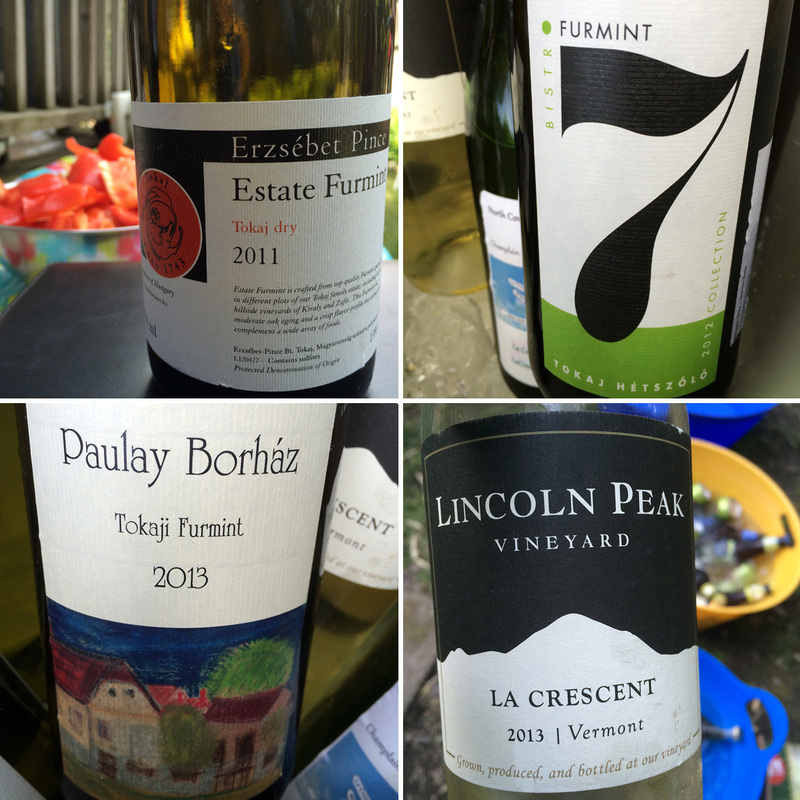 FirstGrillers were pleasantly surprised by this opportunity, and across the board are looking forward to seeing more Furmint in the market. The last pair of wines we selected came from the Granstrom family’s Lincoln Peak Vineyard just outside Middlebury, Vermont. Yes, Vermont. There was plenty of meat on the grill and the red wine-blooded members of the crowd jumped right in, quickly dispatching the Los Vascos Grande Reserva Carmenere. Fresh, round, plummy and spicy, the tasters were pointing each another in its direction. 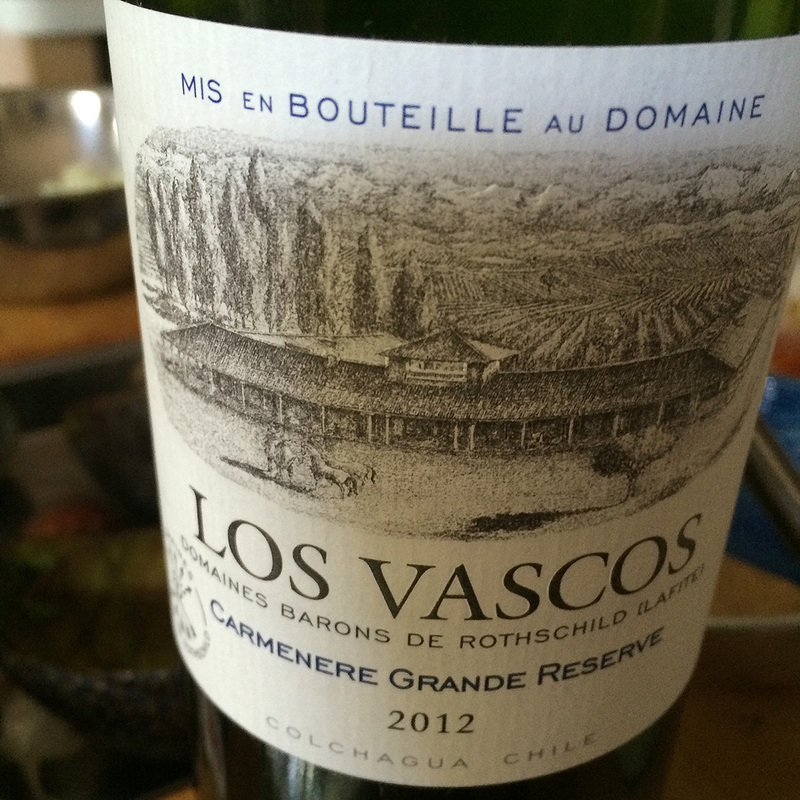 Many were familiar with the Los Vascos label, but at least half of them had not heard the tale of The Lost Bordeaux Grape, the Carmenere, and its rediscovery in Chile. 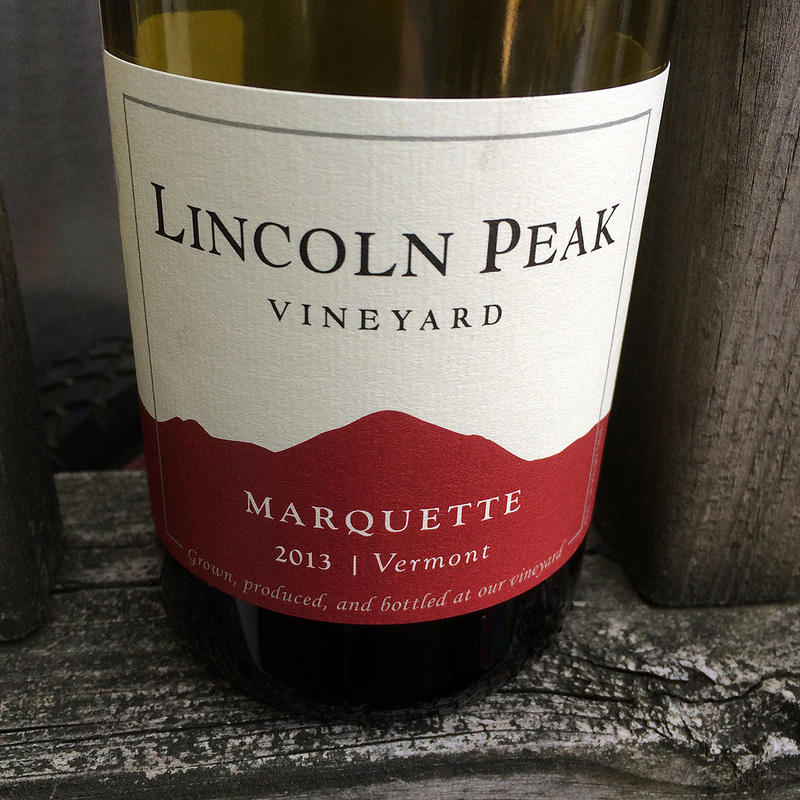 Lincoln Peak’s Marquette also received heavy scrutiny, as New Englanders always want to know what kind of red wine could possibly grow in Vermont (they’re a skeptical bunch). To a person, happy surprise was the reaction. While folks noted the lower levels of tannin and higher fruit acid quality than the other red wines being poured, they seemed to find its saucy sour cherry and black raspberry goodness quite refreshing and a good foil for the Kobe beef from Morgan Ranch. 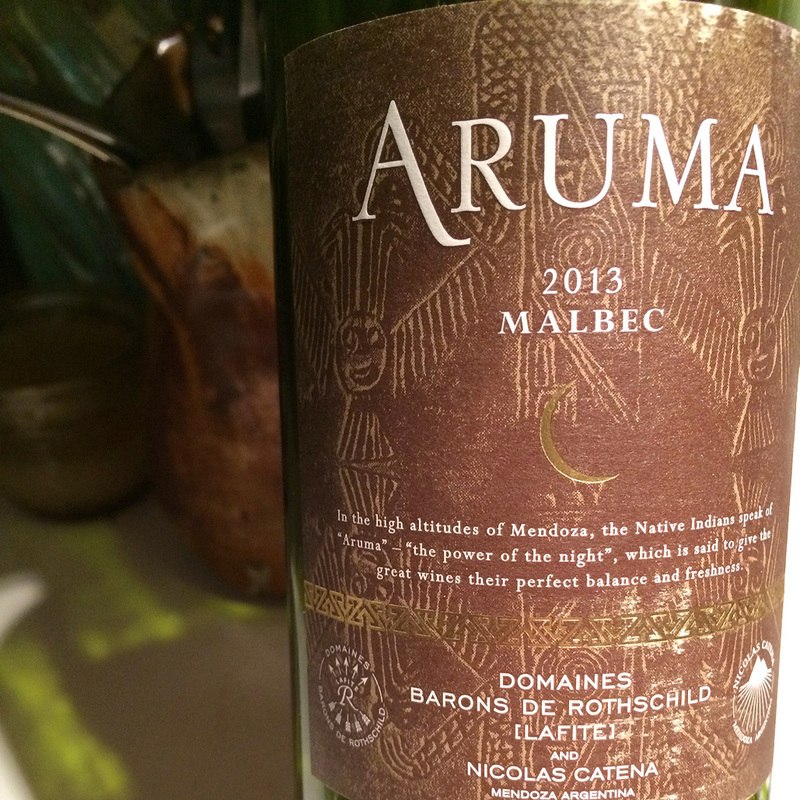 The Aruma Malbec also stood out for both its fine tannin backbone and its light fresh cherry tartness. A clear, unadorned, and perfectly ripened high-altitude Malbec, with a fruit acididy that was in nearly the same ballpark as Lincoln Peak. All three were great with the grilled beef as well as the grilled mushrooms and eggplant. 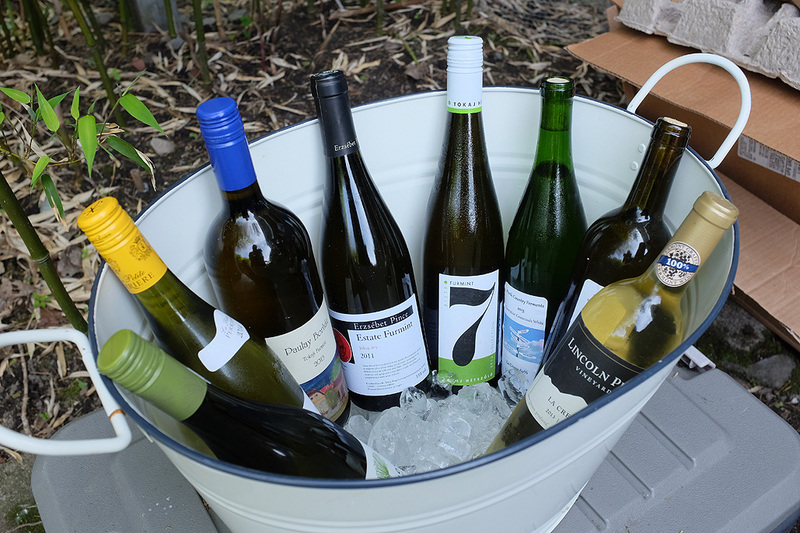 Everyone usually thinks of red wine with grilling, which I can understand, but white wines offer huge value to the summer setting. 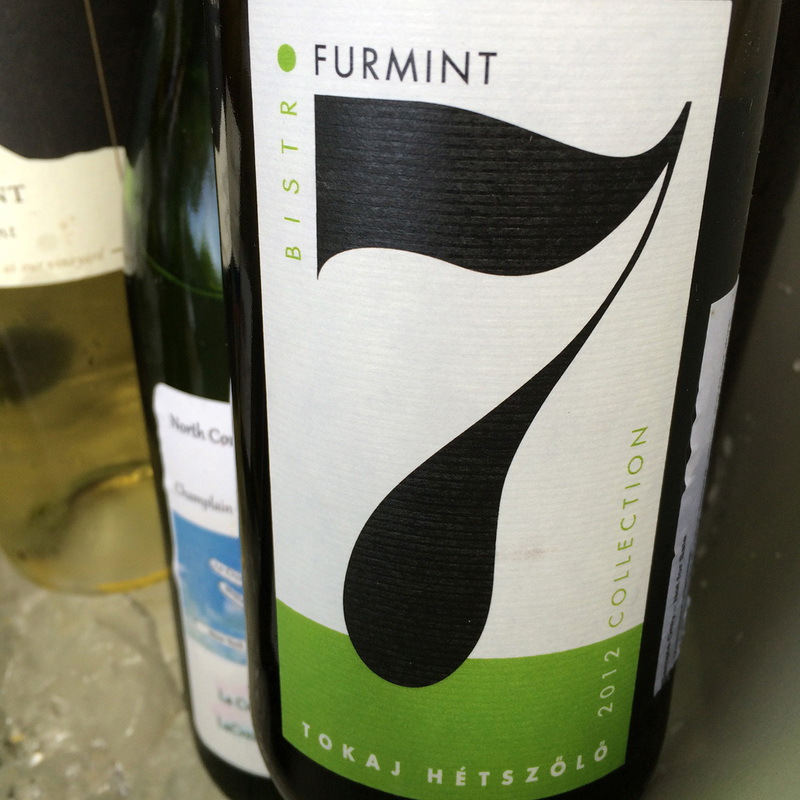 Most folks who tried the Furmints from Hungary were very intrigued by what they tasted; one participant approached the table and immediately proclaimed, “I think I’m in love with Furmint,” and was very eager to try what was on offer. What the tasters got was a taste of three vintages, from dry to off-dry with all the complex fruit and stony flavors that Furmint serves up. 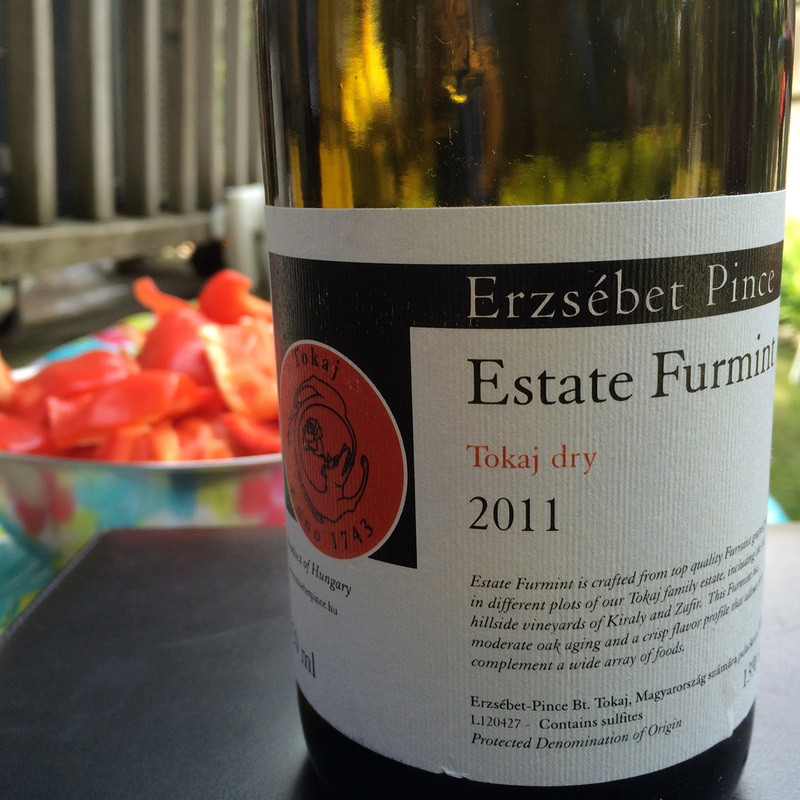 Erszébet Pince Estate 2011 – Slippery texture, soft kiss of green melon flesh and rind. Lingering tang with wet stone still remaining. So elegant, so easy to appreciate the sensitivity and craft in the making. Tokaj Hetszolo 7 2012 – More melon rind, soft stone fruit, green apple and herbaciousness presenting like a refreshing love child of Gruner Veltliner and Seyval Blanc. Paulay Borhaz 2013 – Sweet herbs and stone fruit. Salty and savory. Long and nuanced transit across the palate. Folks said it was like a four act play in the mouth and were very glad it came in a liter, offering up a second ticket to the show. One taster said, “This wine is somewhere between Chardonnay and Riesling.” How right she was, given the fact that Furmint is a half-sibling of those grapes (they share the common parent Gouais Blanc). The Furmints may have stolen most of the white limelight but the other participants showed nicely as well. The Dashwood Sauvignon Blanc was predictably snappy. Upon sipping it, one attendee who had spent time down under immediately blurted out that the wine tasted like New Zealand. Grassy and aromatically pungent, tropical fruit, guava, and citrus pith were big in the glass and a good companion for the veggie grill. The Lincoln Peak La Crescent’s lemon-fresh nose had eyes popping. It’s crispness cleansed palates and it went especially well with baked beans. Go figure…I guess finding unlikely combinations is another reason why FirstGrill matters. The le Petite Perrire Sauv Blanc was fresh and creamy and very easy to enjoy. One attendee who’d been dropping a lot on Sancerre recently said she would be making this one part of her daily table lineup. Many fresh tastes and bites of information were shared at FirstGrill 2015 and we are sure it won’t be our last. Cheers!